In summer 2018 Danielle attended two FTE programs. First, our flagship program Economics for Leaders at Yale University. Following this program she traveled to our Leadership Academy in Washington, DC which is an extension program to EFL that challenges participants to take their FTE experience to the next level by applying the economic reasoning propositions to historical analysis and to leadership dilemmas. 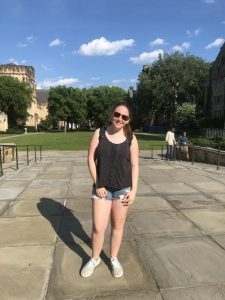 Danielle attends Great Neck High School in New York where she is an active member in her school’s Model United Nations club, DECA and the French club. Her favorite subject in school is math or science and after attending Economics for Leaders she would like to major in Economics in college. Her favorite part of the program at Yale were the morning econ classes. Danielle is also passionate about women’s equality and coming up with new business ideas. You can learn more about Economics for Leaders and the Leadership Academy on our website!